← Must Be, Because of My Shoes. HELLO IT IS TIME FOR US TO HELP. felt in some small way. REINFORCED WITH ADAMANTIUM? YOUR DOING IT WRONG. 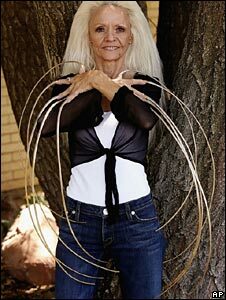 “Lee Redmond from Salt Lake City, Utah, had not cut her nails since 1979.
on THEGTG. Or at least they should be. Also We Have Our Own Blog Now! thanks for coming through on this one APC, you really came through on this. Come see us with with Opeth (GTG) and Girl Talk (GTG) on the 26th at the Lansing Center. How sad… I wonder how long it will take her to grow them back out. She started growing them in 1979. I don’t think she’s gonna make it back to her former nail glory.